This is a sponsored post. However, I agree with all the sentiments and as it happens my sister and her family are at Centre Parcs right now! 1. 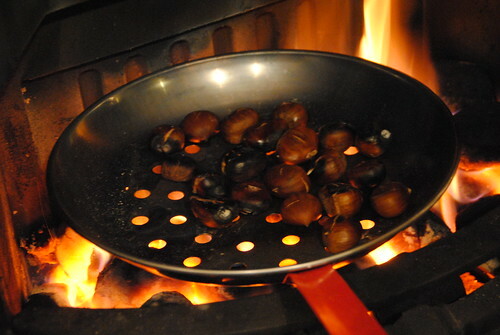 Roast Chestnuts – A classic bonfire night snack. The taste of these lets me know that winter is well and truly here. A simple treat to make that can be prepared either in the oven or over a hot fire. Slice a cross in each one and place in the fire/oven (200°C) for half an hour. For a proper rustic feel serve them in a little brown paper bag. The sweet kernels are a perfect winter warmer, and are ideal for bonfire night. 2. Bonfire Toffee – Less and less common at bonfire nights nowadays this reminds me of my youth. This dark and sticky treat is sure to thrill the crowds. It is made by heating 450g of brown sugar with 125ml of hot water. When all the sugar is dissolved add a quarter teaspoon of tartar, 115g of black treacle and 115g of golden syrup. Bring to the boil and then tip into a tin to cool. Once cooled remove from the tin and break apart ready for eating. Delicious. 3. Toffee Apples – Tooth breakers, as my parents used to call them, are a staple of bonfire night and a great treat for children. To make you should cover eight apples in boiling water to remove the waxy layer from the skin, this makes the toffee stick a lot easier. Push a wooden skewer into each apple. Make the toffee by heating 100ml of water and mixing in 400g of golden caster sugar. The toffee is ready when you pour a little bit out of the pan and it hardens and becomes brittle. If the toffee is still squishy keep boiling it. When the toffee is ready, dip and twist each apple in the molten toffee and leave to harden completely. 4. Mulled Wine – And so on to a couple for the adults. Because let’s face it what is bonfire night without a warm drink laced with booze? To make this classic Victorian mulled wine mixture you will need to pour two wine glasses of water in a saucepan with 115g of sugar, 4 cinnamon sticks, a small handful of cloves and the zest of an orange. Bring the mix to the boil and then cool to the lowest heat and simmer for around 20 minutes, stirring regularly until it becomes thick and syrupy. Add 1.5l of port wine or claret and increase until mixture is piping hot but not boiling. Serve immediately, straining the mixture if desired. 5. Hot Spiced Cider – A very similar drink to the mulled wine but one I have seen boom in popularity. It seems all the fancy pubs in my area wheel out a variant on hot-spiced cider in one way or another. This heart-warmer is made by adding 1l of cider, 4 tbsp. of honey, 1 orange peel, 2 cinnamon sticks, a small handful of cloves, 2 tsp. of ground allspice and a healthy splash of Cider Brandy where available to a saucepan. The mixture should then be heated gently for around 15 minutes and drunk whilst still hot. So there we have my list of five, extremely indulgent, treats for bonfire night. I haven’t even mentioned Parkin (ok I have now!). I have tried to cater for everyone, children and adults alike. If you are anything like me you still get a flutter of excitement as November draws closer and closer with Guy Fawkes welcoming us into winter. If you have any other tasty treats up your sleeve for this bonfire night let me know in the comments below. I agree with ALL of the treats suggestions and especially the Hot Spiced Cider!